Art Deco (1920-40) — Architectural style characterized by an overall linear, angular, vertical appearance, often ornamented with zig-zags, chevrons and vertical projections above the roof line. Beaux Arts (1885-1925) — Architectural style characterized by monumental and imposing appearance, symmetrical façade, a variety of stone finishes and embellishments of garlands, quoins, pilasters and paired colossal columns. Bungalow (1890-1940) — Architectural style characterized by low-pitched rooflines, broad overhangs, dormer windows, porches with large square piers or tapered support posts and many windows with broad, flat casings. Colonial Revival (1870-1950) — An architectural style characterized by a balanced façade, the use of decorative door crowns, pediments or porticos to emphasize the front entrance, double-hung windows with multiple panes and frequent use of decorative cornices. Dutch Colonial (1625-1830) — An architectural style characterized by a steeply pitched gable or gambrel roof with a pronounced eave overhang, Dutch doors and commonly six-over-six double hung windows with exterior shutters. Federal (1780-1830) — An architectural style characterized by overall symmetry, semicircular or elliptical fanlight over a six-panel front door with elaborate trim, decorated cornice and six-paned, double hung windows. Georgian (1700-1780) — An architectural style characterized by symmetry of floor plan and facade, usually gable roof and central chimney, entrance door flanked by columns or pilasters and capped by a decorative crown or a triangular pediment and six-pane double windows. Italianate (1840-1889) — An architectural style characterized by two or three stories, visually balanced facades, decorative bracketed crowns or lintels over windows and doors and narrow double hung windows and double doors. Queen Anne (1880-1910) — An architectural style characterized by irregularity of plan and massing, variety of wall textures, variety of window treatments, multiple steep roofs, large porches and frequent use of bay windows. Keystone — The wedge-shaped stone found at the center of an arch. Lath — Wood or metal strips that are attached to framing members and are used as a supporting base for plaster, tiles, shingles or other building materials. Masonry — Work constructed by a mason using stone, brick, concrete blocks, tile or similar materials. Molding — A continuous decorative band which often serves the function of obscuring the joint formed when two surfaces meet. 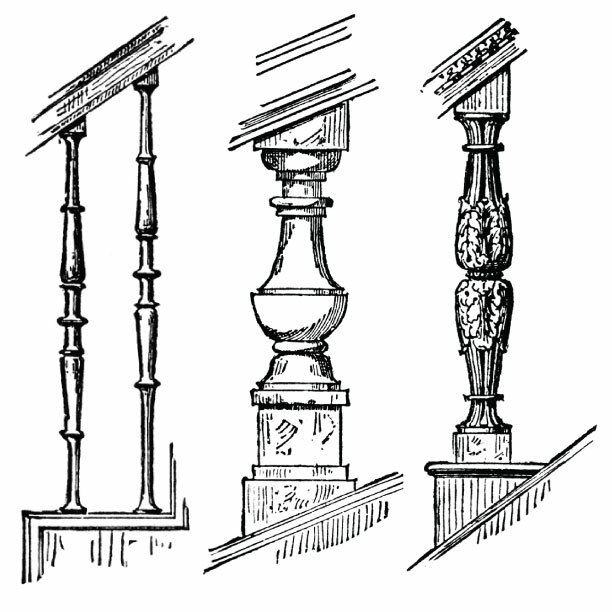 Newel Post — The post supporting the handrails at the top and bottom of a stairway, usually with a decorative cap. Pane — A single piece of window glass. Windows are often described according to the number of panes they have. For example, a window with eight panes of glass is call an eight-light window. Often a double-hung window is described in terms of its two sashes (e.g. six-over-six window indicates that each sash has six panes). Pediment — A triangular section framed by a horizontal molding on its base and two sloping moldings on each of its sides, often used as a crowning element for doors, windows, etc. Streetscape — The distinguishing character of a particular street as created by its width, paving materials and the design of the surrounding buildings. Sidelight — A usually long fixed sash located beside a door or window, often found in pairs. Soffit — The exposed underside of an arch, cornice, balcony, beam, etc., sometimes embellished with panels or other decorative devices. Stringcourse — A continuous horizontal band of brick, stone or wood on the exterior wall of a building used for decorative purposes or as a means of breaking up a large expanse of wall surface. Summer Kitchen — An auxiliary kitchen, often added to a house at a later date, used when it was desirable to keep the heat of cooking removed from the main living areas. Transom Window — A small window or series of panes above a door or above a casement or double hung window. The horizontal member that separates a transom window from the door or window below is called a transom bar. Baluster — A series of short pillars or other uprights that support a handrail or top rail. Balusters are often lathe-turned, although they are also quite often simple square posts and cutouts. Balustrade — A series of balusters connected on top by a top rail or handrail, used on staircases, balconies, porches, etc. Casing — The finished visible framework or trim around a door or window. Chair Rail — A wooden molding that runs along an interior wall at the level of the back of a chair; may also serve as the crowning piece at the top of a wainscoting. Coffering — Decoration on a ceiling formed by recessed panels, sometimes highly ornamented. Corbelling — A series of projections, each stepped out farther than the one below it; most often found on masonry walls and chimneys. Cornice — The projection at the top of a wall, the top course or decorative molding of a wall. Crown Molding — The crowning or finishing molding, most often located in the area of transition between wall and ceiling. Denticulated — That which is embellished with dentils (small square blocks found in series) or dentil-like ornamentation. Dormer — A vertical window projecting from the slope of a roof. Entasis — In classical architecture, the slight convex curve of the shaft of a column. Escutcheon — a decorative plate that is placed behind a door knob, keyhole or light switch to protect a surface from excessive wear. Façade — The principal face or front elevation of a building. Fanlight — A semicircular or fan-shaped window with a radiating glazing bar system, usually found over entrance doors. Fascia Board — A flat board used to cover the ends of roof rafters. 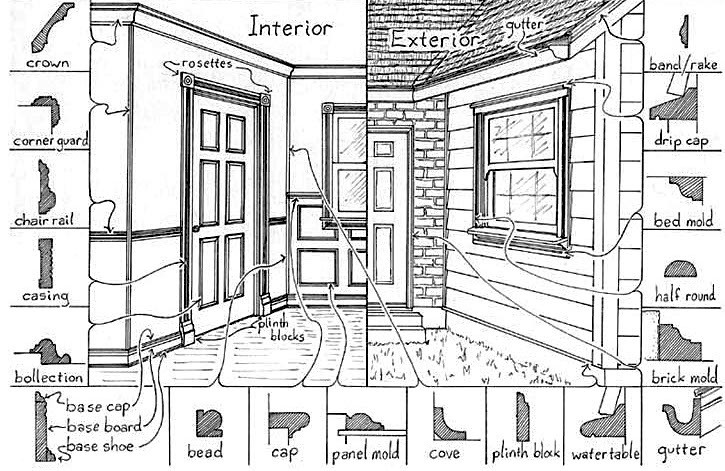 Fixed Sash — A fixed frame window (or part of a window) that does not open. Flush Door — A door with plain flat surfaces. French Door — A door characterized by having glass panes throughout its entire length, usually found in pairs. Frieze — ny plain or decorative band, or board, on the top of a wall immediately below the cornice, sometimes decorated with festoons or other ornamentation. Gable — The triangular end of an exterior wall in a building with a ridged roof. Hip Roof — A roof formed by four pitched roof surfaces.